This journal publishes articles and papers that report on and analyze the latest research and innovation in every area of security. The journal also presents reviews of books, videos and security sector reports, opinion essays and expert commentary on important current issues. Founded in 1989 and associated with ASIS International, Security Journal offers sophisticated insight into the latest research and progress in the field of security. The journal presents authoritative information on the latest developments and on current issues, in an accessible style that appeals to researchers and working professionals alike. 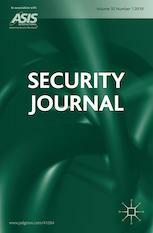 Security Journal brings new perspective to the theory and practice of security management, with evaluations of the latest innovations in security technology, and insight on new practices and initiatives. Among the topics covered are new security management techniques, as well as news, analysis and advice regarding current research.